Two weeks ago, I purposed to eliminate refined sugars and flour from my diet. The new and kind of drastic change in eating habits has inspired me to try new vegetables and clean eating recipes. The first four days of detox were painful to say the least, but I’m so glad that I have made this change. I have more energy, I’m more clear-headed and I don’t feel sluggish or bloated. This veg is on of my new favorites and I have purchased six in the last two weeks. They’re cheap, versatile and a great substitute for spaghetti noodles. 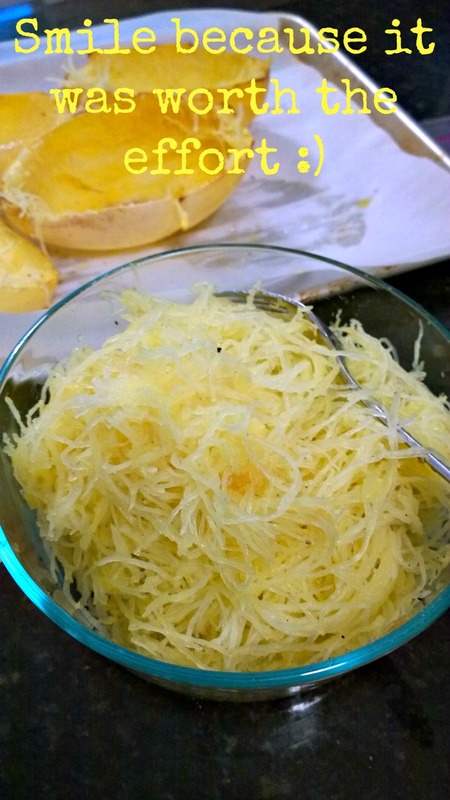 This side dish is so darn quick, easy and flavorful that I could eat it daily – the hardest part is cutting the squash in half. All you need is a roasted squash, good olive oil, chopped garlic and Parmesan cheese to make this savory and satisfying side dish. The first time I served it along side sautéed tilapia and steamed peas. The next three times I served it along a spinach salad with my favorite maple Dijon dressing. 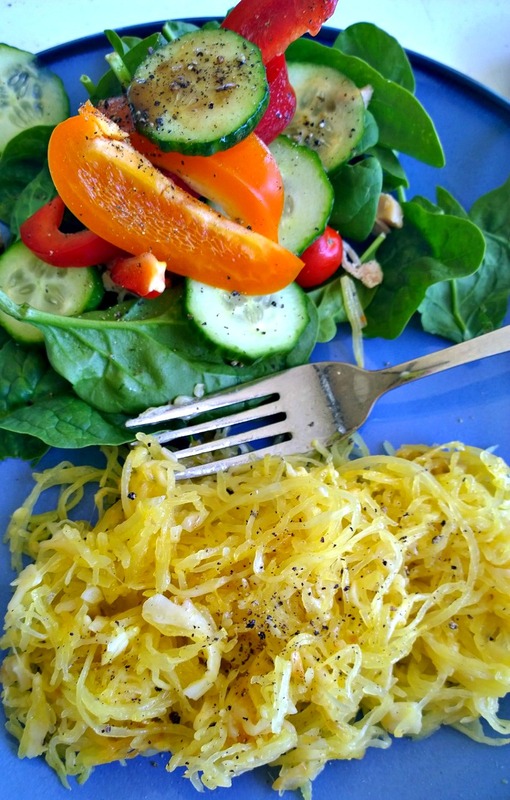 Soon I will share with you the other clean eating recipes I have tried, like my favorite peanut butter, banana and chocolate smoothie, stuffed zucchini boats; and a spaghetti squash bake that tasted even better the next day. Thanks for reading, enjoy! Heat the oven to 375°F and arrange a rack in the middle. 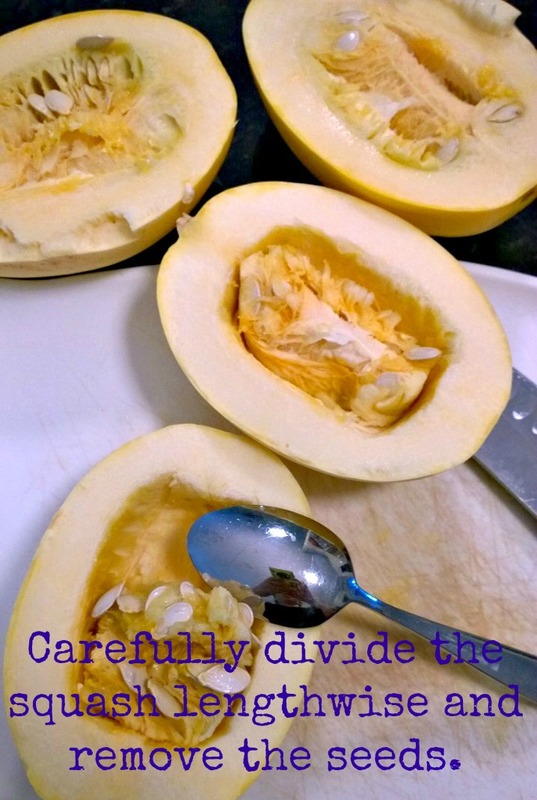 Cut the squash in half lengthwise and scrape out the seeds. Brush the flesh with 2 tablespoons of the oil and season generously with salt and pepper. 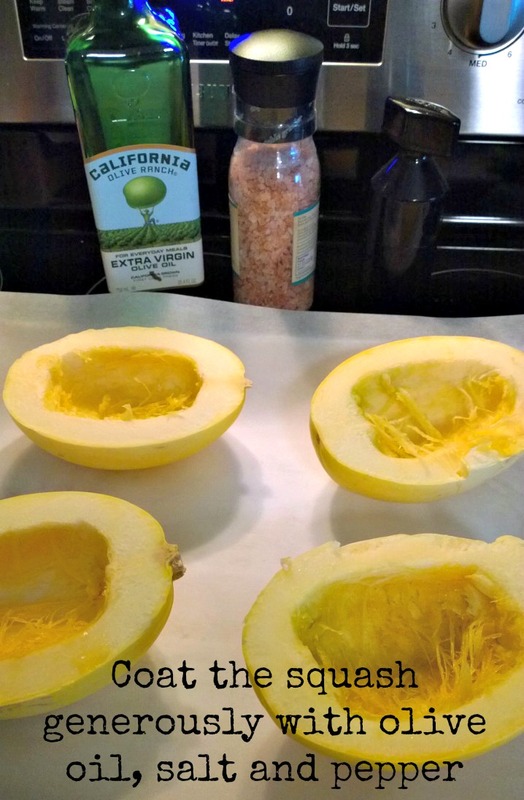 Place the squash halves cut-side up on a baking sheet and roast until fork tender, about 40-50 minutes. Remove the squash from the oven and let sit at room temperature until cool enough to handle, about 30 minutes. 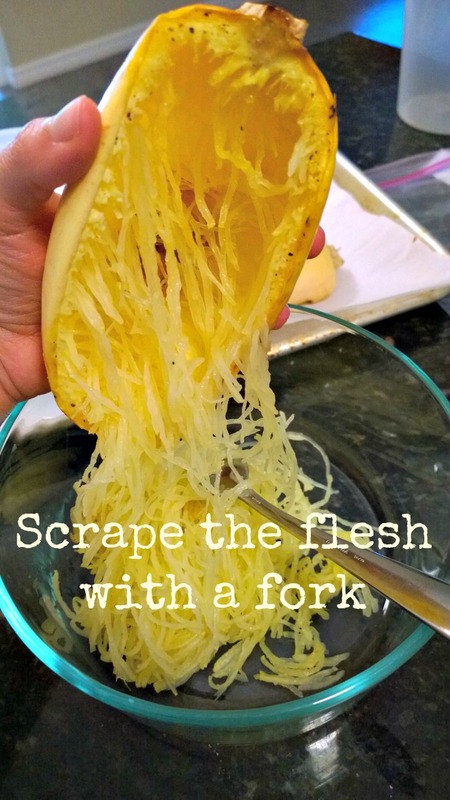 Scrape the flesh with a fork to make long strands; set aside. Heat the remaining 2 tablespoons of oil in a large saucepan over medium heat until shimmering, about 3 minutes. Add the garlic and shallot, season with salt and pepper, and cook until softened and lightly browned, about 3 minutes. Add the reserved squash, toss with tongs to coat thoroughly, and cook until heated through, about 3 minutes. Remove from the heat and add the cheese a handful at a time while tossing the squash to evenly coat. Serve with freshly ground black pepper and extra cheese.